What is the best LED face mask? Does home light therapy work? LED light therapy has increased in popularity, especially since affordable at-home solutions started appearing on the market. We’ll review the best LED face mask for rejuvenating your skin. But first, we want to make sure you are not wasting your money, so we’ll take a look at whether home LED light therapy really works. Does home LED light therapy really work? Most home LED light therapy products use 3 colors of light: red, green, and blue. Usually, the idea is that blue light kills bacteria while red light promotes skin cell growth and recovery. Green light is in between. Marketers will add in extra words, like how LED reduces inflammation, promotes circulation, stimulates collagen, or activates stem cells. Is any of this true? The short answer is that yes, LED light therapy has benefits for skin, but scientists don’t understand exactly why. So using a home LED face mask can improve your skin, but the marketing terms behind it are probably junk. The non-invasive nature and almost complete absence of side-effects encourages further testing in dermatology. Provided an LED phototherapy system has the correct wavelength for the target cells, delivers an appropriate power density and an adequate energy density, then it will be at least partly, if not significantly, effective. Fantastic, so according to the scientists LED light therapy likely has benefits for the skin. However, there are many ways to implement LED light therapy. The question is whether the products you can buy as a consumer are also likely to work. We’ll take a look at one consideration, and that is color. As we mentioned above, most home LED face masks come in 3 colors. There are also some single color products. Which color should you get, and do they all work? Red light has the most scientific evidence to support its healing effect on the skin. The quotes from Dr. Hamblin and Dr. Calderhead both relate to red LED light therapy. You can find numerous scientific reports studying the effect of red or infrared light on the skin, and we think it’s pretty clear that red light has a healing and stimulatory effect. However, scientists do not understand exactly why red light heals skin. There are some guesses that red light stimulates part of a cell called the mitochondria, but really, scientists are still trying to figure out the exact mechanisms. They do agree it works, though. Just like red light, there is good evidence to support the use of blue light as a skin therapy. Dr. Michael Gold, a dermatologist based in Tennessee, studied the use of blue light in treating acne. In this initial study, there was some evidence that blue light therapy may affect acne. The way blue light works is not entirely clear. Many assume blue light targets bacteria for killing, and that may be the case. However, blue light may also stimulate skin cells, regardless of bacteria being present or not. So we can probably conclude that blue light, like red light, has benefits for skin care. Green light is the least studied of all three colors. Dr. Marcos Pinotti notes that most studies on human or animals used red light, and there is less data on blue or green light. Green light may help skin, but its effects are much less established compared to red and blue light therapy. Scientists don’t understand fully how light therapy affects the skin. However, they do agree that it works. In this case, we think the best option is trying out at least red and blue LED light therapy, and seeing how it goes. 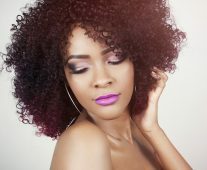 You can always try one color at a time, see if it makes a difference, try the other color, combine colors, and so on. We don’t think there’s a need to look for an extravagent 7-color system or other expensive device. The results for red and blue light alone are pretty clear and convincing. Now that we’ve addressed the question of whether home LED light therapy works, let’s look at the best LED face mask option for you to try. 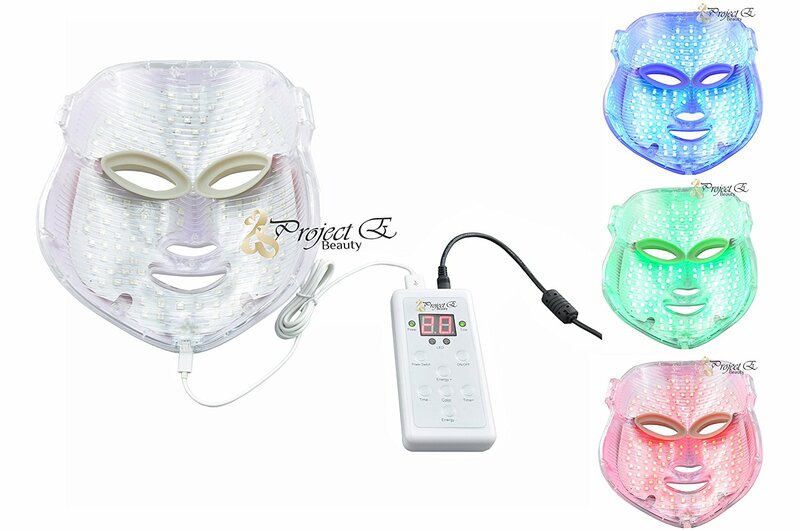 Our recommendation for best LED face mask is Project E Beauty’s Phototherapy Mask (Amazon link). This LED face mask provides red, green, and blue light in a convenient package with rave reviews from Amazon customers who see real skin improvement. The mask is convenient because it has built in eye shields. That means you can wear the mask and watch TV or do other tasks while you wait. You don’t have to lie still on your back. The stand-alone LED therapy devices like this are all larger and more expensive, while still requiring you to wear safety googles. We think the LED face mask style is much easier to use, while being cheap and portable. Project E Beauty’s face mask can be re-used many times. It’s recommended that you start your treatment with about four 20-minute sessions a weak, and then taper down to two maintenance treatments a week once you see results. You can find cheaper LED face masks from Neutrogena and some other companies. However, these companies make masks that can only be used 30 times before you have to buy a new one. The only reason the companies do this is to force you to spend more money. Unlike Neutrogena, Project E Beauty gives you full control to use the mask as many times as you want. Read through customer reviews, and you will find that people have successfully used this LED face mask to treat wrinkles, acne, redness, freckles, and many other skin issues. We therefore gives this product our recommendation as the best LED face mask. Other skincare methods can complement LED light therapy. Consider trying Korean snail creams (our reviews here) for skin repair. For general skin rejuvenation or tightening, home Botox alternatives or gentler facial massagers are other possibilities.